Follow Melanie Graham on her tour throughout Canada for “A Soldier’s Story”…. 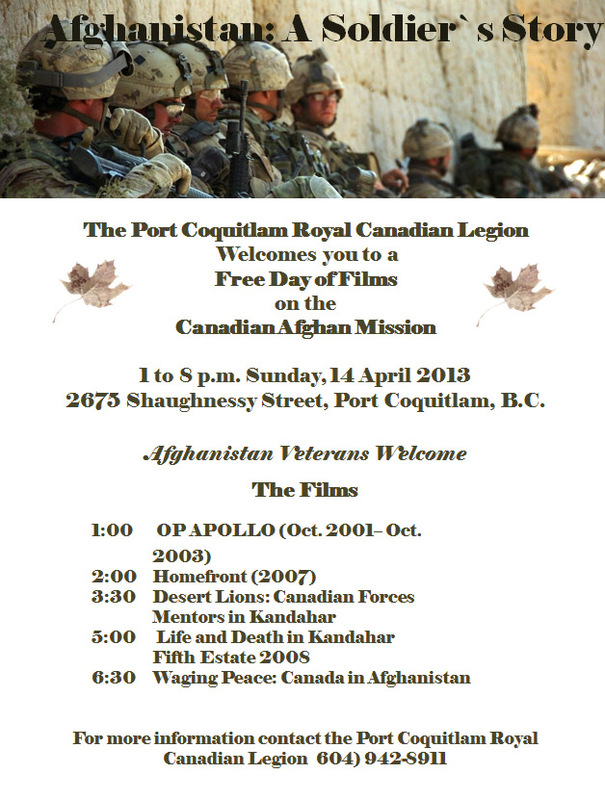 The Port Coquitlam Royal Canadian Legion, is hosting the film series in order to share with Legion members and local Canadian communities, a glimpse of the boots on the ground Canadian experience in Afghanistan. Those who served Canada in Afghanistan are also encouraged to share the stories and images from their experiences there with the legacy album “Afghanistan: A Soldier’s Story” for publication November 11, 2014. Afghan Veterans will have an opportunity to contribute their stories and imagery throughout the film series. 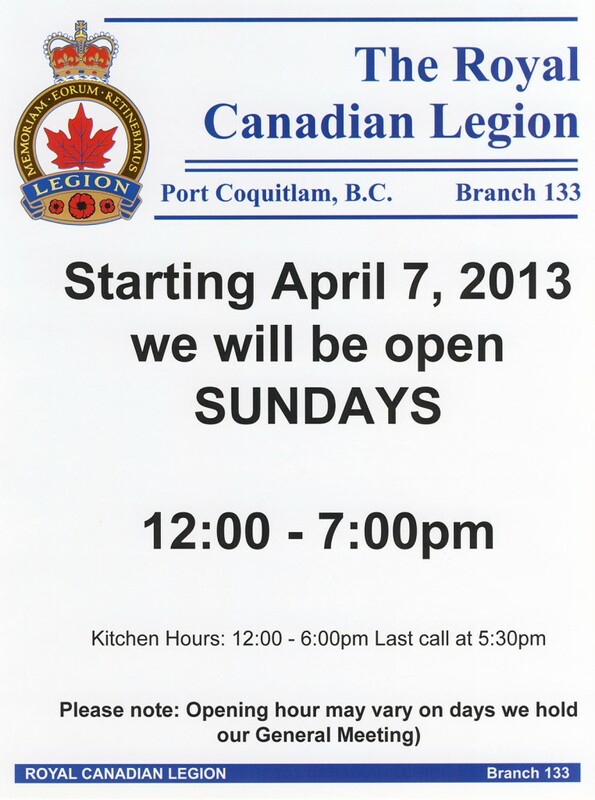 The dining room and bar at the Port Coquitlam Royal Canadian Legion will be open throughout the film series. 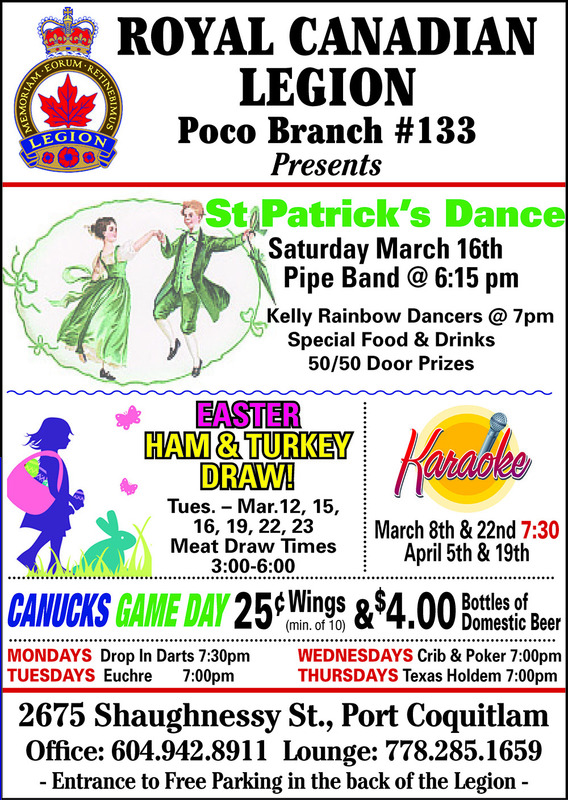 Where: Port Coquitlam Royal Canadian Legion, Branch 133, 2675 Shaughnessy Street, Port Coquitlam, BC. The Main entrance & parking for the Port Coquitlam Legion are at the back of the building. 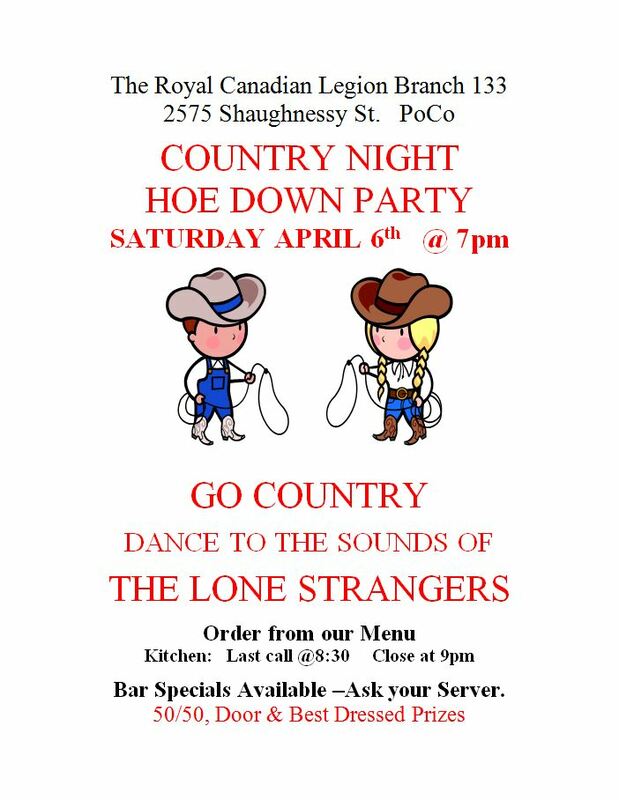 When: April 14, 2013, 12:00 noon to 8:00 pm. Films Line up for 14 April: 1:00 p.m. OP APOLLO (Oct. 2001– Oct. 2003), 2:00 Home Front (2007), 3:30 Desert Lions: Canadian Forces Mentors in Kandahar, 5:00 Life and Death in Kandahar Fifth Estate 2008, 6:30 Waging Peace: Canada in Afghanistan. For more information on “Afghanistan: A Soldier’s Story” contact Melanie Graham, project coordinator, email consult@mywrdwrx.com or go to http://afghanistanacanadianstory.ca/ . On September 12, 2001, one day after the terrorist attacks in the U.S., NATO invoked the principle of Article 5 of the North Atlantic Treaty, which states that an attack against any of the NATO member countries is an attack against them all. After confirming that the terrorist acts had been conducted from abroad, the Article became fully operative on October 2, 2001, and Operation APOLLO had begun. Canada was among the first coalition nations to deploy a naval task group into the U.S. Central Command area of responsibility, which stretches from the Horn of Africa to Central Asia. Between October 2001 and 2003, 18 of 20 ships deployed, including HMC Ships Toronto, Halifax, Charlottetown, Iroquois, Preserver, Vancouver, Ottawa, Algonquin, St. John’s, Protecteur, Montréal, Winnipeg, Regina, Fredericton and Calgary. While deployed, ships participated in force-protection operations, fleet-support operations, leadership interdiction operations, and maritime interdiction operations. Canadian Naval Boarding Part personnel hailed more than 10,000 ships and conducted more than 260 boardings – almost 60 percent of the entire coalition fleet’s boardings. Home front is a one-hour TV Documentary, produced by Reel Girls Media Inc. 2007, in association with Global Television, about the heroes behind the heroes. Homefront records the experience of the spouses, children, parents, and families of Canadian soldiers steadfastly waiting at home as our military engages in its most dangerous mission since the Korean War – stabilizing Afghanistan. By viewing the story of our international reconstruction effort in Afghanistan through the eyes of those Canadians who shoulder and understand the sacrifice most acutely, the documentary prompts enlightened answers to the dramatic question: why do we do this? Filmed in the heart of Taliban country by army reservist and former CBC reporter Mike Vernon, Desert Lions is an on-the-ground look at Canadian soldiers in Afghanistan. Stationed in Nakhonay, one of the deadliest regions in Kandahar Province, Vernon documents the daily lives of the Operational Mentor and liaison team (OMLT), which provides training and support to the afghan national army (ANA). OMLT is more than just a team of mentors. Living in a converted school in the centre of the city, the team shares jobs, meals and even living quarters with its’ ANA counterparts. That camaraderie isn’t always easy, and Vernon captures the tension that comes from culture clashes, 40-degree heat and the constant threat of attack. An honest, unvarnished view of military life, Desert Lions is as close as most of us will come to understanding the efforts of our dedicated soldiers abroad. Life and Death in Kandahar begins with an urgent alert. Incoming wounded are on their way. Now, the questions begin: How many are there? What are the injuries? How soon will they arrive? As the medical staff gathers critical information, trauma bays are prepped and ambulances head out to meet the medevac helicopters. In the winter of 2008, the fifth estate cameras were granted four weeks of unprecedented and exclusive access to the NATO trauma hospital at the main military base in Kandahar Province. The ‘Role 3′ is one of the busiest trauma hospitals in Afghanistan and it has been under Canadian command for two years. Follows Canadian Richard Fitoussi on a personal quest into the fiercest parts of Afghanistan’s war-torn southern frontier to learn why Canadian soldiers are dying in a mission that has sparked more controversy than any other military intervention in Canadian history. Embedded with the Canadian military alongside established war correspondents. Fitoussi sees for himself what is at stake for the Afghan people and the Canadians who serve in our name. As his journey unfolds, Fitoussi is faced with the realities of modern day peacekeeping, and tries to distinguish between the reality on the ground and the rhetoric of the U.S. led “war on terror”. In the end he witnesses the ultimate sacrifice of young Canadians in a journey that nearly costs him his life. The documentary series, The Veterans, illustrates the impact of Canada’s participation in foreign conflicts and crises on Canada, Canadians and the military and covers the period from the First World War up to and including Afghanistan. The Veterans consists of 52 episodes each of 40 minutes in length. The project was three years in the making, was a volunteer, not-for-profit undertaking and contains interviews with and location filming of veterans, serving men and women of the Canadian Forces (CF) in Canada and around the world, the Canadian defence and security industry, DFAIT, CIDA, CSC, RCMP, CWM, police forces, NGOs, the military colleges, military historians and a host of other Canadians. The documentary is a gift to the Canadian people and is of particular relevance to young Canadians, tomorrow’s leaders, as it emphasizes civics, citizenship, nation building and leadership. This is a unique, historical account of Canada’s military and the impact and contributions made by our gallant veterans and military personnel. It is a tribute to them and the manifold sacrifices for which they are remembered and commemorated. Select episodes of documentary can be viewed at www.pwu.ca by clicking on the logo The Veterans. The entire documentary including the original footage will be available in the CWM’s archives and military history research department. The production team consists of Daniel R. Rodrique (producer and director), Colonel (Retd) Andrew Nellestyn OStJ HCE PhD (Co-producer) and Don MacKinnon (President Power Workers Union of Ontario and principal sponsor). A CBC documentary produced by 90th Parallel Productions in 2010 goes beyond the static photographs and news headlines and gets to know the men and women who paid the ultimate sacrifice. The film introduces a new generation of Canadian heroes. The film allows viewers to meet their spouses, siblings, children, and parents, reminisce with their old friends at home and re-live life in Afghanistan with their comrades in arms. The film also bears witness and explores the true human cost of war. There is also an online component, found at http://www.cbc.ca/documentaries/doczone/wewillrememberthem/tribute/ that is intended to extend identification with our soldiers and to preserve their memory. Here filmmakers further expose the stories that surrounded our troops’ lives, investigating the personal connections that made them who they were and illuminating the context of their service careers. Personal stories from friends and loved ones are enriched by comments and stories from people everywhere. This film honours the impressions our soldiers’ lives have made and explores the enduring connections and communities that surrounded them. We Will Remember Them is a tribute to the fallen – an honour roll to help make sure that the lives of these soldiers will not be forgotten. “Afghanistan – A Soldiers Story” is a growing compilation of the very human stories and photographs of Canadian soldiers, sailors and air men and women who deployed with the Canadian Afghanistan Combat Mission between 2002 and 2014. The aim is to organize the content in a commemorative album that will allow those who served Canada in Afghanistan an opportunity to share their experiences with the Canadian public. Net proceeds from book sales will go to the Boomers Legacy Foundation, the Edmonton Military Family Resources Centre, the Military Families Fund, and the Soldier On Fund. The stories and images for “Afghanistan – A Soldier’s Story” will be arranged in a chronology that follows our engagement in Afghanistan. As such it will be a welcome and positive legacy for the CF members who served, for the families and friends of the fallen, for schools, and for the Canadian public. The book will be an 8.5” by 11” hard cover publication, organized in chapters by year and operation, to share with Canadians the stories, reflections and images produced by CF members and CF agencies such as Army News and Combat Camera. Contributions from journalists who embedded with the mission will also be incorporated. Each chapter will be introduced by a summary of the relevant historical events that shaped and inspired the subsequent soldier’s stories and images. Most of the material for the proposed book already exists so the bulk of the initiative involves gathering, sorting and organizing the best of the available content. There was a successful public launch of http://www.afghanistanacanadianstory.ca , the project web site, at the Edmonton Garrison Officers Mess on November 14, 2011. The web site is interactive, allowing CF members, retired and serving, as well as civilians and media that deployed, to upload content according to carefully explained guidelines and protocols. There is also an email content for direct submissions. Families of the Fallen are also invited to submit. At this point approximately 150 pages of content have been submitted. The print version of the book has a cap of 206 pages, but there will also be an e-version, available through KOBO that can accommodate far more content. The book is being prepared for publication and distribution, through Chapters Indigo, by well-known Canadian photographer and publisher John McQuarrie. 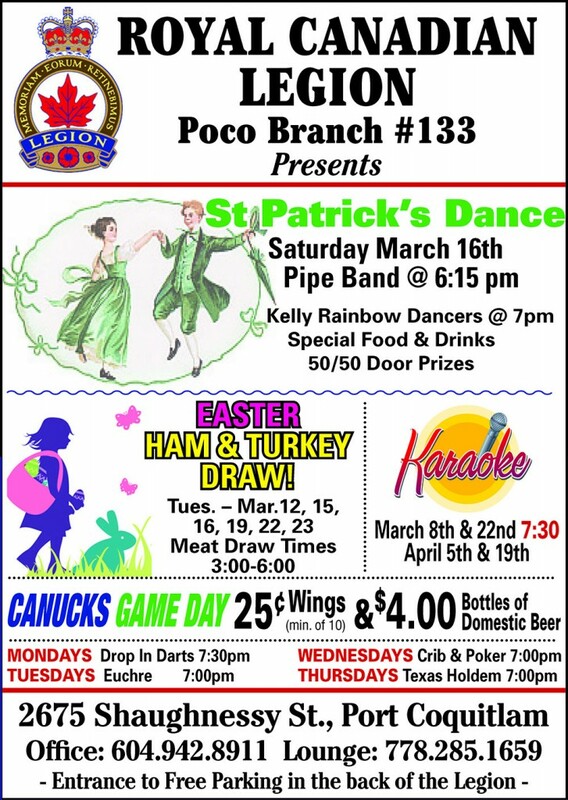 The Royal Canadian Legion, Port Coquitlam Branch #133, announces that eight (8) Education Bursaries are available to students attending public and private high schools in School District #43. Four (4) Bursaries in the amount of $2,013 each will be awarded to qualified applicants through the Legion Poppy Fund. Children; or grandchildren, of ex-service personnel are eligible to apply. Financial need is also considered in adjudication of the application. As well, four (4) Bursaries in the amount of $2,013 each are to be awarded through the Branch #133 Education Fund. Applicants need not have any military or Legion Affiliation. Awards are based on financial need and good grades. Total family income cannot exceed $60,000 per annum. Applications are available through High School Counsellors or from the Legion Office @ 604-942-8911 or from the Chairperson of the Education Committee @ 604-464-2169. Congratulations to Comrade Irene Brown who; with great pride and honour, received her Diamond Jubilee Award. 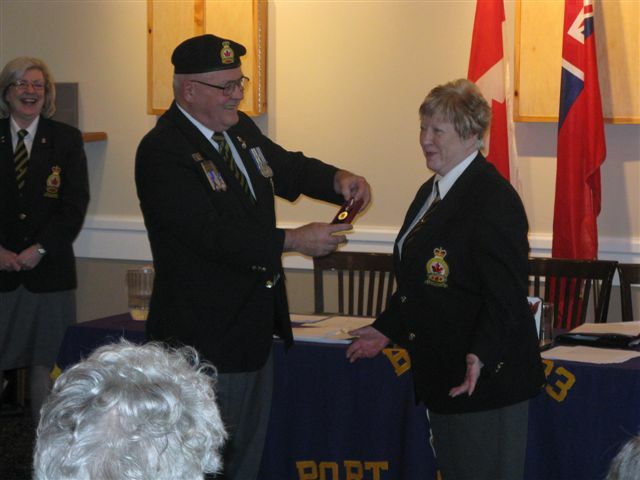 Comrade Brown was nominated by her fellow Executive and Branch membership for her tireless dedication to the Legion Branch #133, during extremely difficult times. Irene was surrounded by members, family and friends who she thanked for their love and support over the past 3 years of her term in office as President of this Branch.